In another revolutionary move, BEST has decided to focus on becoming more public-transport centric and turn itself from a loss making body to a profitable one. In other words, BEST has decided to become the BEST, by taking on NMMT and TMT head-on. BEST has decided a reshuffle of its AC routes, cancelling two, reconsidering a few and proposing a few more! Apart from this, 50 routes across the 27 depots are slated to be cancelled. A simple change in the BEST committee in the MCGM. After close to a decade, the BJP took over the committee from the Shiv Sena. Rather ironic, given that the Sena is anti-Toll while the BJP is pro-Toll. If you recall, it was the Sena that hiked the fares of BEST in 2015, first in February and then in April in 2015. A quick recap would show that the BJP has always been adept at providing good transport wherever it has been, be it in the form of the Mumbai-Pune or Ahmedabad-Vadodara Expressways, the BRTS corridors in Ahmedabad, Rajkot, Surat, Bhopal and Indore, BMTC and KSRTC which showed a massive turnaround under R Ashoka, the erstwhile Transport Minister of Karnataka. Back in 2005, BEST, had introduced the Smart Card system with Kaizen Automation, in the form of the Go Mumbai smart card, which was a common mobility smart card for both BEST buses as well as trains on the Suburban Railway. These were subsequently phased out in favour of the present Trimax system that BEST uses. BEST, which officially turns 70 in its current form next year, and currently has a debt burden of ₹2,250 crore, plans to change its logo as well the colour of the buses in a major move to rebrand itself. BEST has written to the Sir JJ Insititute of Applied Arts, one of the city’s premier art institutes to guide it in the process. The colour change is part of an exercise to make BEST more acceptable among customers. The Mumbai Monorail, operated by the MMRDA, got the National Institute of Design [NID], Ahmedabad to design its coaches. One hopes that BEST too, would reach out to NID, or maybe even the Centre for Enviornment, Planning and Technology [CEPT], Ahmedabad for some ideas in design and operations. Among other changes, are the rates of passes, monthly, as well as daily passes. Magic AC: ₹200 to ₹150. Magic Non-AC: ₹70 to ₹51. Suburban Pass: ₹50 to ₹36. Island City/Town: ₹40 to ₹29. However, these are valid only during the Happy Hour period of 11am to 5pm. The question here is, if the pass is cheaper post 11am, nobody would buy a pass before that. An alternative explanation is that passes purchased between 11am and 5pm are not valid during the rest of the day, which is an inconvenience to those who might purchase a pass after 11am, but may need to use it at 9pm. I guess, an official explanation from BEST would be the best thing to wait for. While, BEST currently has good integration with the Suburban Rail, what is desired it better integration with the Metro, Monorail, and MSRTC services. BEST recently announced that it would ply AC services to Imagica. Yep, you heard that right. BEST, which has been incurring heavy losses for several years now, has decided it will ply AC buses to Imagica. Apart from this, BEST has managed to get Diamond Traders to sign a ₹80,000 agreement for bus services from Andheri to Seepz. BEST is also looking at tying up with IPL to provide bus connectivity to stadiums during matches, something that BMTC has been doing for the past few years. BEST also announced that they were in talks with Essel World to provide buses. The bus to Imagica leaves from CST at 7am in the morning and costs ₹500 for a round trip. Tickets can be booked the previous night on Imagica’s website. Now, the question is, what buses is BEST using? Since it is a weekend bus, they can probably use the Volvo on Sunday when AS-4 is not operational. Using them Purple Faeries on this route, would severely ruin BEST’s image as only a handful of them are good, mostly from the Oshiwara Depot. The BEST must not make the BMTC mistake however. BMTC rents out its newer Volvo buses to corporate bodies such as Manayata Embassy Business Park [MEPB] and the Outer Ring Road Companies Association [ORRCA] and leaves the older, much older KA-01-FA series Volvo buses for the public to use. This is a good opportunity for BEST to resurrect the pathetic image that the AC fleet today has earned and replace it with the Premium luxury one that MSRTC enjoys for itself. BEST must ensure that all six Volvo buses don’t go for corporate trips leaving us at the mercy of the Purple Faeries. The Volvo buses must continue running on AS-4 and be used on the Fort Pheri services instead of idling at Backbay Depot. Similarly, BEST can use the AC buses that arrive at Colaba Depot as AS-9 on similar ring routes in SoBo with a subsidised fare to make them lucrative. This is needed, to keep the fleet running. All said and done, I’m now excited at the prospect of seeing a BEST bus on the Mumbai-Pune Expressway and hope to get to click a photograph soon. Arrival at Adlabs Imagica at 10.30am. Tickets can be booked on the Adlabs Imagica Website. 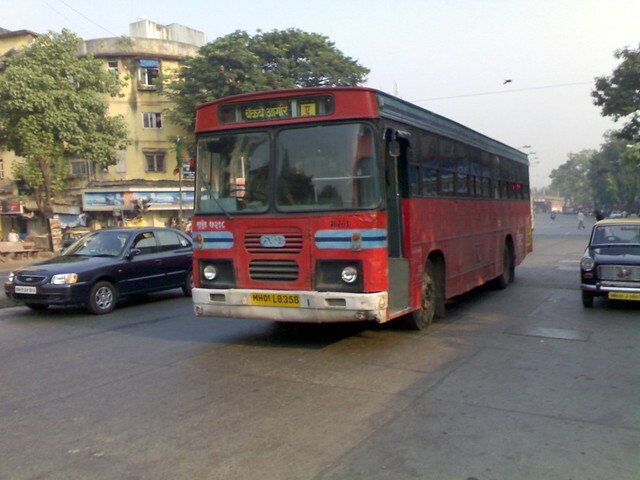 Buses from Borivali are provided by Neeta Travels. Who knows, this might be BEST soon.